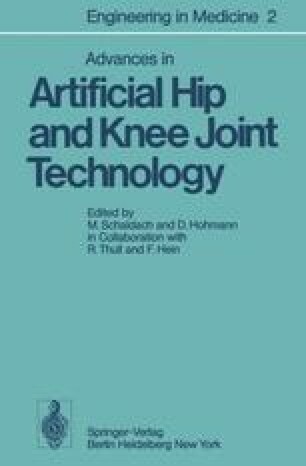 The success rate, measured by the number of cases that exhibit postoperatively normal or almost normal articular function, is greater in the case of the total replacements of the hip joint than in the case of the knee joint. The number of existing models for alloarthroplasty of the hip is smaller by far. They differ primarily in the mode of anchoring the individual prosthetic components: with or without cement (Shivas), supporting fin principle (Mittelmeier, Tragrippenprinzip), isoelastic prosthesis (Mathys), shorter stem with three-point support or longer stem, — and, closely connected with this, the materials used: metal/metal, metal/ polyethylene, metal/ceramic, porometal, isoelastic materials, etc. On the other hand, apart from minor differences (such as head-cup radius relation, safeguard against dislocation) the mechanics of the joint are the same.